Premium 360-degree music video service Mativision has announced the release of a Slash 360 Facebook app, which offers an interactive, 360 performance viewing experience. 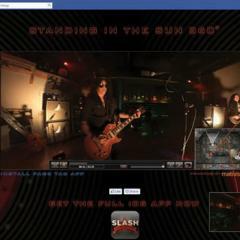 The Slash Facebook app is the world’s first fully integrated 360-degree video platform, broadcasting a fully interactive performance of the guitarist’s US hit single Standing In The Sun. Users can watch from different vantage points and choose between multiple synchronised camera views as well as being able to rotate and zoom in and out in real-time. Mativision’s partnership with Slash has already seen a similar app released for iPhone. “I think the 360 application definitely takes the listener into the world of the musician so that you can actually be in the room where the artist is recording or in a live situation where you can be all around the stage and behind the stage and it just gives it a lot more depth and it really sort of puts you in the world of what the artist is doing,” said Slash. Anthony E. Karydis, CEO of Mativision added: “We are very proud to be working with Slash [for this Facebook App], bringing fans a true Mativision 360 video experience. The fact people don’t even need to leave Facebook to use our app is going to have a big impact for us. It is perfectly optimized for social sharing and spreading the word about Mativision”.